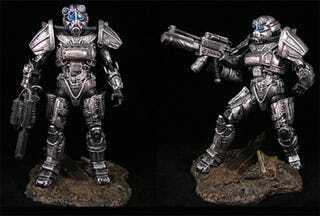 You have another shot at scoring a custom Fallout 3 power armor action figure, if your pockets are deep enough. Jin Saotome, creator of all things custom and articulated strikes again, post apocalyptic-ly. His latest is a second take on the Fallout 3 power armor, now on the Marvel Legends scale — if that means anything to you. That's six inches if it doesn't. Harvesting parts from the Iron Man Movie Titanium Man, a Super Patriot and Dirty Pair action figures, Jin certainly outdoes his previous effort. Wanna learn how to get that shiny battle-damage look? Mr. Saotome explains! But if you don't feel like crafting your own, this one's for sale. Best of luck bidding — it ain't cheap.